by invitation of the President Vladimir Vladimirovič Putin , there has been a meeting at the Embassy of the Russian Federation in Rome. 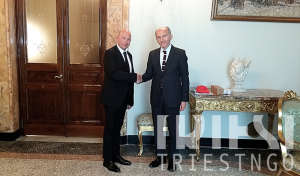 A delegation of TRIEST NGO has been received by the Minister-Counselor of the Russian Embassy in Italy Dmitry Shtodin and by the second secretary Danis Bashirov . 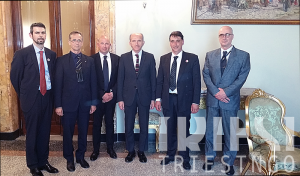 The conversation went on for over two hours, during which the delegates from Triest NGO were able to express into detail the current situation of the Free Territory of Trieste, as well as of the Free Port (and Free Zone) of Trieste. This is one further step for the informational activities that Triest NGO is carrying on towards respected and influential representatives of the International community, in order to achieve the application of the Human and Civil rights of citizens and residents of the Free Territory of Trieste.